One Size - 38 in wide x33 in long. It's cut quilter style with a rotary cutter. 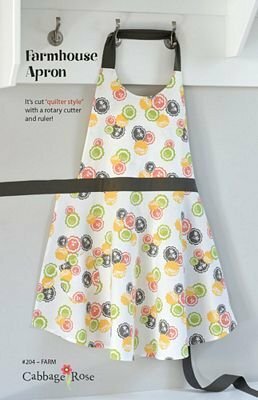 Bake a pie, simmer a pot of soup, the twirl around the kitchen in a simple and easy apron pattern. The skirt is cut very feminine with a slight curvy flare; and yes, it's cut with a rotary cutter and ruler! This apron is so flattering that you'll have to make several for gifts.